This week, Your News to Know brings you the latest stories involving gold and the overall economy. Stories include: Gold could hit $1,475 if it follows copper’s path, trade war talk pushes gold prices higher, and gold and titanium restore vision to blind mice. According to one fund manager, gold is in a good spot for prices to set off and reach multi-year highs. Kitco reports that Will Rhind, CEO of GraniteShares, told the attendees of his webinar that gold could push to $1,475 an ounce if the yellow metal follows copper’s cue. Rhind said that the current environment is right for gold and his firm only sees it getting better. Drawing the comparison to copper, Rhind explained how copper prices rallied to the 50% retracement level from the 2011 highs to the 2015 lows. He says gold could surpass $1,400 an ounce by following the same movement. Rhind noted that the rise of market volatility and the threat it poses to global growth expectations puts gold in a spot to outperform copper. “An environment where volatility is increasing is conducive for gold, more so than for other commodities like copper and silver that are more linked to business cycles,” he said. Talking about the potential catalysts for gold’s upswing, Rhind pointed to a surprise in inflation expectations as a likely driver. The executive also said that he is keeping an eye on the equity market for a possible correction, as it would also signal the beginning of a bull run for gold. President Trump’s recent passing of higher import tariffs reignited fears that other countries would respond in kind, potentially leading to a global trade war. An article on Newsmax writes that the introduction of a 25% and 10% tariff on steel and aluminum imports, respectively, brought the dollar down and heightened demand for haven assets. 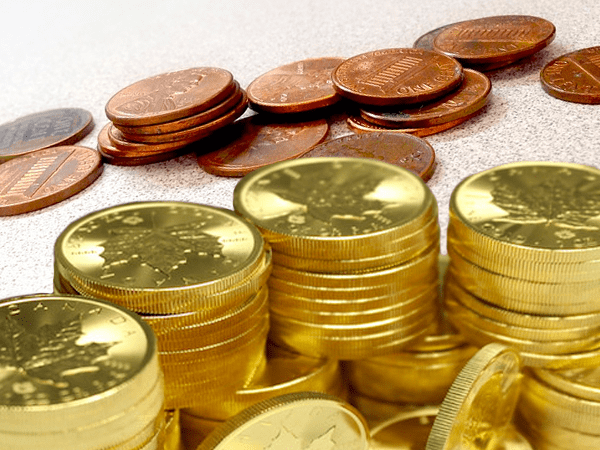 “The risk of trade wars which could impact economic growth and raise uncertainty plays into the hands of gold,” said Saxo Bank analyst Ole Hansen. He noted that concerns over retaliations were strong enough to offset the recent hawkish tone of the Fed, which is usually seen as negative for gold. Hansen said that a trade war would push inflation up and growth down, limiting the Fed’s ability to raise interest rates. Gold has also shown strong technical momentum as it held above its 100-day moving average price at $1,300, which represents an important level for investors. The metal further benefited from heightened buying by funds, as they recently increased their total bullion holdings by 17 tons, or 1%. This shows that investors are viewing the lower price as a buying opportunity, wrote Commerzbank analysts in a note. A team of Chinese researchers may have achieved a breakthrough in eyesight restoration using gold and titanium. According to an article on Futurism.com, scientists from Fudan University and the University of Science and Technology of China turned to artificial photoreceptors to partially restore sight in blind mice. The researchers first degraded the mice’s natural photoreceptors before replacing them with artificial versions made from gold nano-wires and titanium dioxide. The new sensory structures allowed previously-blind mice to view a spectrum of colors, such as green, blue, and ultraviolet. The gold-backed photoreceptors were left in the mice for eight weeks, during which time none of the subjects showed negative side effects of the implants. Although it isn’t yet clear how much vision was granted to the mice using this method, a partial restoration was confirmed through pupil dilation. With the technology still in its infancy, this experiment gives new hope to those suffering from retinal degenerative conditions that a treatment could be on the horizon.